Marianne Schnall: What effects do you see on your own daily life regarding your relaxation and meditation practices? 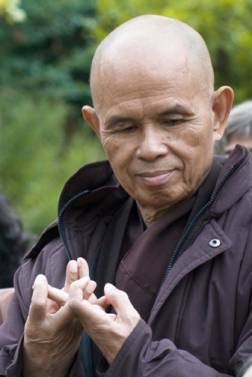 Thich Nhat Hanh:The therapeutic power of meditation is very great, as modern scientific studies are now showing. The practices of mindful breathing, sitting meditation and walking meditation release tensions in the body and also in the mind. When we give ourselves the chance to let go of all our tension, the body's natural capacity to heal itself can begin to work. Animals in the forest know this; when they get wounded, ill or overtired, they know what to do. They find a quiet place and lie down to rest. They don't go chasing after food or other animals -- they just rest. After some days of resting quietly, they are healed and they resume their activities. We humans have lost the wisdom of genuinely resting and relaxing. We worry too much. We don't allow our bodies to heal, and we don't allow our minds and hearts to heal. Meditation can help us embrace our worries, our fear, our anger; and that is very healing. We let our own natural capacity of healing do the work. Total relaxation is the secret to enjoying sitting meditation. I sit with my spine upright, but not rigid; and I relax all the muscles in my body. Breathing in, I bring my attention to one part of my body; breathing out, I smile with gratitude and love to that part of my body. For example, I breathe in and I bring my attention to my face. On my face there are about 300 muscles, and whenever I get worried, angry or sad, these 300 muscles harden, and anyone who looks at me can see that I'm tense. But if while breathing in I can be aware of my face, and breathing out I can smile to my face, then that tension immediately dissipates. It's almost like a miracle. In just a few breaths we can feel peace, happiness, and relaxation on our face. Our face becomes light, fresh, like the kind of flower it was before. Every face is a flower. After breathing three or four times with "breathing in I am aware of my face; breathing out I smile to my face," then I can breathe in and bring my awareness to the muscles in my shoulders, because our shoulder muscles are often tense. As I breathe out, I relax and smile with my shoulders. Gradually we can move through the whole body, so after just a few minutes we can already normalize our body so it feels light and relaxed. This is something everyone can do in the first minutes of sitting, and not only when we are in the meditation hall. Wherever we sit, we can sit beautifully, just like we are doing sitting meditation, and we will feel stability and freedom. Sitting down to eat or do paperwork, we sit upright and relaxed. Let us sit like the Buddha. I know some members of Congress who practice walking meditation on Capitol Hill. One of them says that when he goes to the floor to vote, he always practices walking meditation, stopping his thinking completely. His office is very busy; every day he has to answer many questions, to deal with so many different things. So the only time during the day when he can really stop his thinking and get a rest is when he goes out to cast a vote. He focuses his mind entirely on his breathing and on his steps, not thinking at all, and he says it helps him a lot to survive the hectic life of a Congressman. It's very important that we re-learn the art of resting and relaxing. Not only does it help prevent the onset of many illnesses that develop through chronic tension and worrying; it allows us to clear our minds, focus, and find creative solutions to problems. We will be more successful in all our endeavors if we can let go of the habit of running all the time, and take little pauses to relax and re-center ourselves. And we'll also have a lot more joy in living. MS: What do you think the effects are on people who feel they are having relaxing time using electronics, i.e. computer, TV, tweeting? TNH:This reminds me of something I've noticed with people going on vacations. The purpose of a vacation is to have the time to rest. But many of us, even when we go on vacation, don't know how to rest. We may even come back more tired than before we left. What's that about? Relaxation is essential for our physical, mental, emotional and relational well-being. Because it's so important, I encourage our readers to check in with themselves before and after they engage in activities they do for fun and relaxation, and see whether or not they actually feel better or more relaxed after the activity than they did before. Then they can experiment with sitting meditation, walking meditation or total relaxation practices, and see how they feel after those. MS: A lot of times when we feel we are relaxing, our mind is very busy. How can we become aware of this tendency and prevent our mind from taking over? TNH: Awareness of the activities of our mind is key. Everything begins with our mind. In our Plum Village monasteries, when our minds are dispersed and we hear the sound of the temple bell, we stop our talking, stop our thinking and stop being dispersed. We come back to our breathing, to the here and now, and we get back in touch with what's happening in our mind as well as our body. We become alive and real again, not robots running around mindlessly; and we know what to do and what not to do in that moment. For example, if we're about to eat something unhealthy, the bell gives us another chance to pause and reconsider. If we're busily thinking about how irritated we are at someone, we can stop, become aware of our emotions, look more deeply into the situation, and find a more productive way to deal with it. MS: People often say they are too busy for relaxation time. What simple techniques would you offer to them? TNH: We don't have to schedule a trip to the monastery to enjoy the benefits of stopping for bells of mindfulness. We can use many "ordinary" events in our daily lives to call us back to ourselves and to the present moment. The ringing of the telephone, for example: many of my students pause to breathe in and out mindfully three times before they pick up the phone, in order to be fully present to themselves and to the person calling them. Or when we are driving, a red light can be a wonderful friend reminding us to stop, relax, let go of discouraging thought patterns and feel more space inside. Taking five minutes to play with children or animals, to walk outside and look at clouds or wildflowers, enjoying our breathing - we can already release a lot of tension, relax and refresh ourselves. Identify your own favorite bells of mindfulness, and let them remind you to enjoy being alive! I actually have just written a short book, now in the editing stages, all about this very subject. The tentative title in English is Peace Is Every Breath: Daily Practices for Our Busy Lives and we expect it to be published in 2011. MS: What is your concern for the children growing up being so tethered to electronics? TNH: There are a number of scientific studies showing the negative effects of this. I have seen that one of the biggest drawbacks to relying on electronics as a primary refuge - the place we go to be entertained, to feel "good" - is that we end up feeling not happier, but actually less happy. Electronics can be a constructive tool when used mindfully; but so often we use electronic media and games to distract ourselves from uncomfortable feelings like anxiety, depression, anger, loneliness, boredom, etc. We use media in an attempt to cover over the painful feelings inside us, to fill up the feeling of a void in our lives. What happens when we habitually run away from what's going on inside us and in our relationships, though, is that we end up becoming even more alienated and sad. A lot of TV shows, music and games out there can be quite toxic, watering seeds of craving, fear and violence in us. Yes, life and relationships can be challenging at times; but the more we habitually rely on electronics (just as with drugs, or mindless eating) to numb ourselves to what's happening, the more our problems will persist and proliferate. That's not to say that we should sit around obsessing and ruminating over our problems, either. Meditation - sitting quietly, calming the activities of our body and mind, and enjoying feeling our aliveness as the breath moves in and out - is the most effective way to clear our mind and make a breakthrough in whatever places we're feeling stuck. MS: What do you think the effect would be on our society if a larger percentage of people would actually take time for meditation and/or relaxation? TNH: It's plain to see that there's too much violence, poverty and suffering all around us; but we think we're too small and powerless to make any difference in these things. Maybe there's suffering right here in our own family; maybe a family member is in so much pain that one day he or she will end up in a desperate situation of drug addiction or violent crime. We tell ourselves we don't know how to help that person, and we have our own busy lives to lead. What is it we're so busy with, exactly? For many of us, it's working to pay for the fancy diploma, the new car, the bigger house, the exotic vacation. When we take time for relaxation and meditation, and turn off the constant drumbeat of advertising we've been inviting into our home, we find we actually need very little to be happy. We already have so many conditions for happiness that cost us nothing at all. Just take our eyes, for example. Our eyes are miraculous; they are like a pair of jewels. We only need to open them to see the blue sky, fluffy white clouds, beautiful flowers, the faces of our loved ones. Or our ears: anytime we like, we can take in the sounds of inspiring music, of bird songs, of a burbling stream, of the wind whistling through pine trees. These are wonders of life, accessible to us at any moment through our eyes and ears. Our body's still healthy, our legs are healthy, and these are wonders in our very own body. Can we find fulfillment in these costless joys and live more simply, so we have time to listen deeply to those close to us or write a letter to our Senator? When we wake up, when we become more aware of what's going on, and see what we really need to do (and not do), this easily can bring major changes to our personal lives and also to our entire society. In fact, I don't know what else can. When people's bodies and minds are relaxed, they are much less likely to speak or act in violent ways. We also can access many insights and a wellspring of energy we haven't had since childhood. Women and men throughout history have accomplished seemingly impossible things. The truth is, there's no limit to the positive changes we can make for ourselves and for our society through mindfulness meditation. We just need to begin, where we are, right here, right now. MS: How can we balance being engaged with the world while nurturing our inner life? TNH: We must be willing to challenge the assumption that time spent in relaxation and meditation takes away from our realizing other goals, such as a successful career or successful relationships. My own experience and that of my students has been that, as paradoxical as it may seem, when we take time for meditation we actually gain in the other areas of our lives. For example, in our work life: one really innovative idea can make a huge difference to our bottom line, whether we're selling vacuum cleaners, writing legal briefs, or reducing sick days or other losses of resources. In relationships, both at work and at home, having a relaxed, spacious, alert presence allows us to refrain from saying the fiery words that first pop up in our minds when we get angry. Relationships are like a forest: it takes a long time to build up precious trust, but one really thoughtless act or remark can be like a lighted match that destroys everything. Those of us who practice have seen very clearly that meditation and relaxation are the most effective ways of promoting creative, innovative thinking, intelligent choices, success and satisfaction in all areas of our lives. For more information on Thich Nhat Hanh, visit www.plumvillage.org.